I almost didn't go to see Nellie McKay. 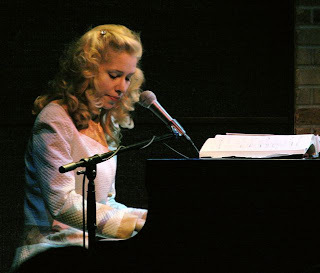 I had heard her debut recording, Get Away from Me, and stories about its inception: She wanted a double disc, Columbia wanted a single, so she paid for the second CD herself; the title is a poke in the eye to Nora Jones's Come Away with Me and Jane Monheit's Come Dream with Me; the songs are all over the map. Since then, Columbia has dropped McKay, who has released two more CDs on her own label, Hungry Mouse. McKay's opening act, The Tropicals, paved the way for oddball tunes, and I listened to Get Away earlier in the day, but nothing could have prepared me for the musical mayhem of the live show. McKay is the Sybil of contemporary music, changing personalities, moods, and voices so often you can't keep up. She's utterly self-confident, incredibly quick, eclectic, ironic, and enormously entertaining. Ours was a sold-out, open-curtain show, yet everyone was focused on the stage, where a small woman sat behind a large piano and occasionally plinked a ukelele Tiny Tim-style. There was a private party in the mezzanine, a group of people who were out for a night and a show, pretty much any old show. They would have talked through a performance by most other singers, making some of us on the main floor want to run upstairs and beat them senseless with warm baguettes. Instead, about two songs into McKay's set, they were as enthralled as the rest of us. Enthralled and speechless. 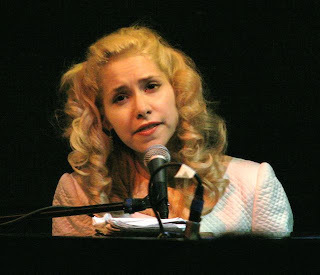 McKay sang songs from her three CDs and songs she's writing for a musical version of Election, the 1999 movie starring Reese Witherspoon and Matthew Broderick. During the latter, she acted out scenes, playing all the roles, miming (badly) and gesturing. Her face is rubber. In fact, it's hard to take a picture of her where she isn't mugging or grimacing. She pretended the Dakota had a revolving stage and walked around the piano. She explained why her nose was shiny (it wasn't): earlier in the day she planned to go to WalMart for a powder compact, but this being Minneapolis, people insisted she shop at Target, which she thought was too expensive so she bought the compact but didn't spring for the powder puff. She told us about growing up in Harlem, where Peter Lawton (of the Tropicals/Kangaroo) roomed with her and her mother. It was a dodgy neighborhood. To walk through it safely, Lawton would push a shopping cart, talk to himself, and pee in his pants. "He taught me everything," she said. She sang a touching and beautiful version of the standard "If I Had You" ("If I had you/I could show the world how to smile/I could be glad all of the while/I could turn the gray skies to blue/If I had you"), accompanying herself on the uke. In an homage to Ella Fitzgerald, she sang "A Tisket, A Tasket." She sang the man-hating "Mother of Pearl" and the puppy-loving "Dog Song," the mocking "I Want to Get Married," and the bayou-infused "Zombie," which is now my favorite song in the world. On the recorded version (which appears on her CD Obligatory Villagers), other people do the zombie voices; at the Dakota, McKay did them all herself. "Do the Zombie, arggh rarghh rarhhh arhhh!" She did the Bill Clinton zombie, the Bob Dylan zombie, the Obama zombie, the John McCain zombie, the Dinah Shore zombie (who remembers Shore singing "See the USA in your Chevrolet"? I do but I'm not telling.) It was a big, sticky musical web and we were helpless little flies. Sometimes she sang flat and vibrato-free. Sometimes she trilled like Jeanette McDonald. She rapped and crooned. She was off key, on key, Broadway and coffee house. Her white suit and Goldilocks hair said old Hollywood until she opened her mouth and screamed "M*****f*****!" "I often forget that I have to perform," she told us midway through the show. "So if I seem unprofessional, I'm just forgetful." I came away thinking she's an old-fashioned, punk and fey cabaret singer. She seems like someone who could entertain herself for long periods of time. She takes a zillion chances and doesn't seem to care. In his review for the Strib, Jon Bream called her a "free-wheeling genius." She just turned 26. What's next, Nellie?